Well, apparently today is National Cheese Day! Who knew? So in honor of that, here’s a recipe that turned out great (according to the toughest critics ~ my kids!) Creamy & delicious. Awesome comfort food. And easy, easy, easy. Inactive prep. time: 12 hours. Active prep. time: 20 minutes. Cost: Less than $10. Serves: 6 – 8. Coat Crock-Pot with non-stick cooking spray. Add cream/buttermilk combination you just made overnight to the Crock-Pot. Add salt & black pepper to the Crock-Pot & stir. Add cheese to Crock-Pot and stir. Cook macaroni according to the package directions, drain, then add to the Crock-Pot and stir. Cover and cook on LOW for 2 hours or until cheese is melted. Please keep in mind that cooking times may vary so the first time you make a recipe, keep an eye on the Crock-Pot. You may need to adjust the amount of cooking time. FYI ~ I made Buttermilk Biscuits to go along with the Mac & Cheese using this fabulous recipe. 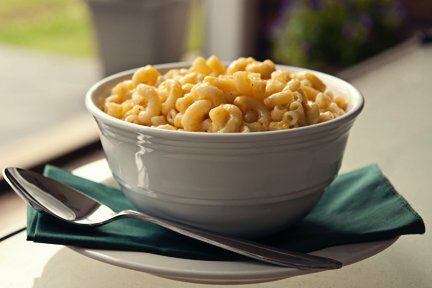 4 Responses to "Homestyle Mac & Cheese"
National Cheese Day… Didn’t know that. That makes it a fav day for me. Hey Rich! I know, right? CHEESE! 😀 It really was awesome. Let me know if you give it a try. This looks absolutely fabulous! I actually have a whole cheese drawer in my refrigerator! Love cheese. It really was delish! Let me know if you give it a try. I LOVE that you have a whole drawer dedicated to cheese! Have a great day, darlin.